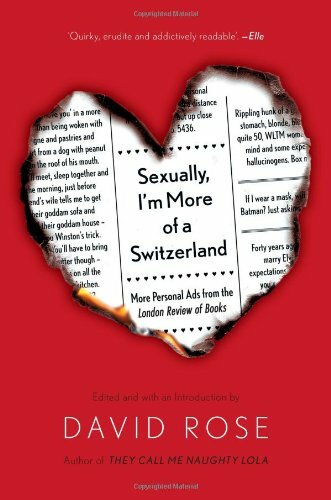 “Sexually, I’m More of a Switzerland” is the second collection of personal ads from the London Review of Books, and a more entertaining series of outrageous little paragraphs you will never encounter. It’s a diverse crowd. Men. Women. Straights. Gays. What they all have in common is the desire to find that special someone. And a good sense of humor. Some of the ads are so silly I wondered if the writer was actually looking for love or just clowning around. Probably a little of both. But, really, who cares? If you must look for love with a personal ad, why not have a little fun with it? The ads may be playful, but it’s easy to sense, between the lines, a serious longing for connection. When you’ve laughed your way through this little book, you’ll put it back on the shelf hoping that all of these folks will find true love. Or at the very least, a fabulous fling with a nervous asthmatic or a Scottish historical battle expert.